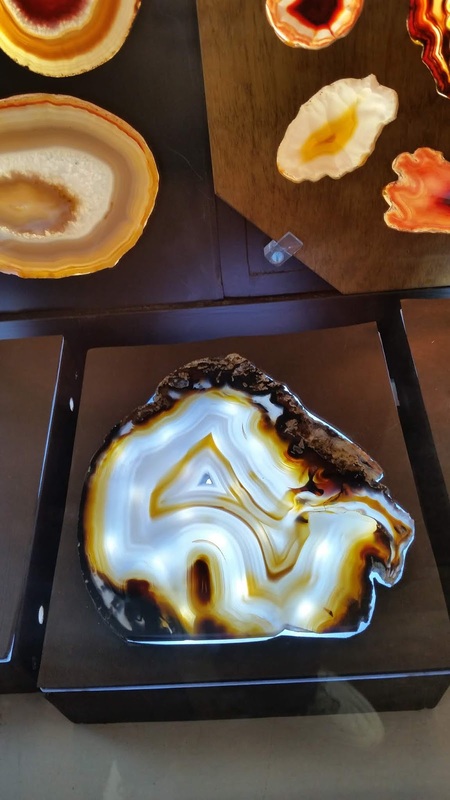 Perhaps some of you remember my post in January 2018 about Channels in Geodes and whether those channels brought material into the geode being formed or drained material out. It was a lot of fun to research and I got some really good answers. But maybe not all the best ones . . . Unfortunately, I went about my research in a less-than-scientific manner beginning with a false belief that since I'd seen and photographed those channels in some geodes, they must have or previously had similar channels in all geodes. Last week I was thumbing through some older Rock & Gem Magazines and found the accurate information,pop right up in front of me. In the June 2016 issue, an article by Marcos Campos-Venuti titled, Big Band Theory: A New Explanation of Band Formation in Nodular Agates. Campos-Venuti wrote, "A connective channel is also a primary structure and has not been formed by deformation of the bands. This channel is simply a small interruption of the and where water flowed quickly into the cavity as opposed to seeping slowly through the porous first chalcedony layer. "For that reason, the terms "outflow channel and "inflow channel" are wrong and result from the erroneous perception that the channel was formed by deformation of the bands from the inside to the inside or vice versa." The mineral-rich water seeps into the hollow area during wet seasons when it is submerged. When the dry season arrives, the water/liquid thickens and adheres to the inside of the geode in bands of chalcedony. 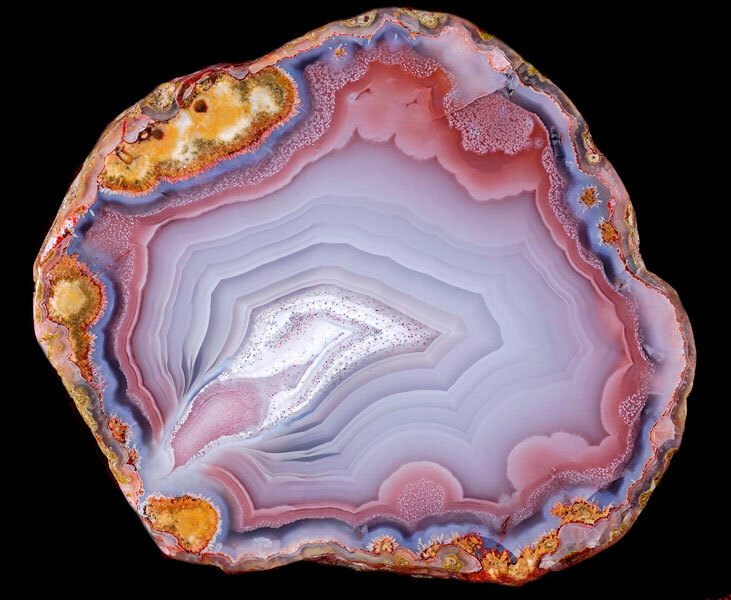 One of the causes of horizontal layers of chalcedony inside a geode can be caused by a slow drying process. When that happens, material can be dripped from the top as (sometimes causing stalactites), settling into flat layers on the bottom. The channels themselves are caused by a weakness or crack in the outer layer of the the geode as it forms. That crack increases the flow of the fluid and can create layers that seem to create a balloon shape rather than a round one with the balloon opening being the channel itself. It's pretty easy to see the channel on the right side because of the staining. Chalcedony wasn't the only material that seeped into this geode. 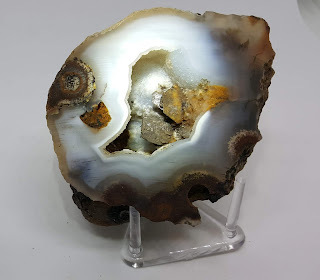 After looking at countless geode images that have inclusions, I believe this cutie contains crystals of sphalerite, It's mineral composition is (Zn,Fe)S or zinc sulfide. The iron in it led to the staining at the opening of the channel and the crystal surfaces after the geode was opened to the air. In last month's blog, I was planning ahead for a fun trip to Tucson and Quartzsite and all the new material that was waiting there for me to rescue it and bring it home so we could get to know each other in my little shop. As the poet Robert Burns wrote back in 1785, The best laid schemes of Mice and Men oft go awry, And leaves us nothing but grief and pain, For promised joy! I hope all of you who manage to go have amazing experiences and find your dream rocks in Arizona this winter.Here's hoping for better luck for me next year.